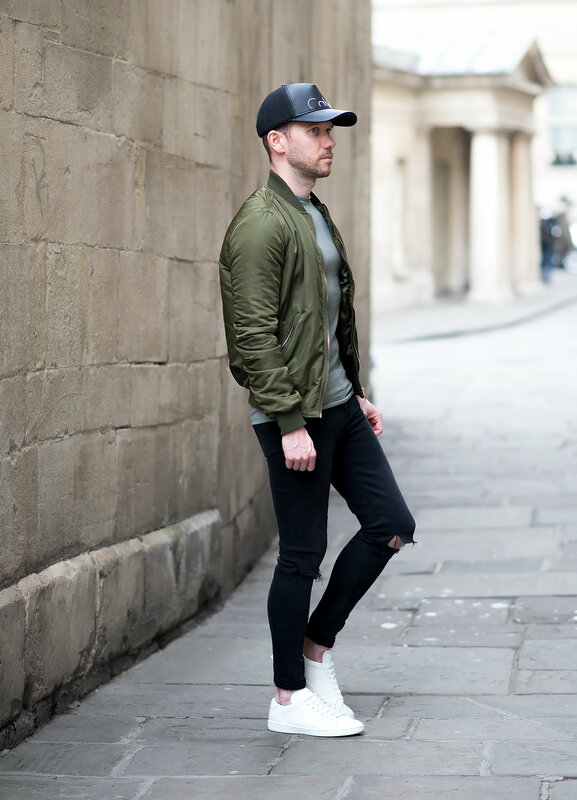 For my latest outfit post I decided to dig out my green bomber jacket, which I hadn’t worn since late last year! It had been left undeservedly beneath my regularly rotated clothing. Upon recovering the Topshop Bomber jacket from its impromptu clothing tomb, I came to the conclusion that I had made a severe mistake not giving it more attention since purchasing! I always believed the green was not well suited to me (green and yellow are colours I largely avoid when choosing an outfit!). However, I found that I quite liked this particular shade of khaki! I may even change my mind and start wearing more greens! 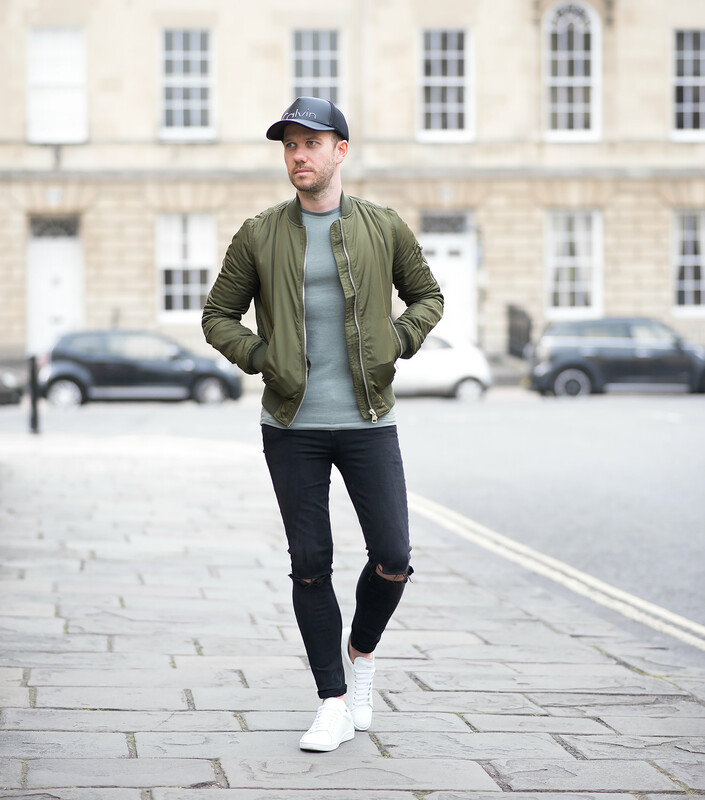 When I reviewed the Topshop Tall MA1 Tall Bomber Jacket For Men I talked about my experience finding one which matched my body type (regular readers may recall that I choose the women’s version to get a more snug fit). Rolling on many months later and the reasons to why I first bought it came flooding back! Still fits as good as I remember, in fact I’m going to keep a look out for any additional colours they might release! 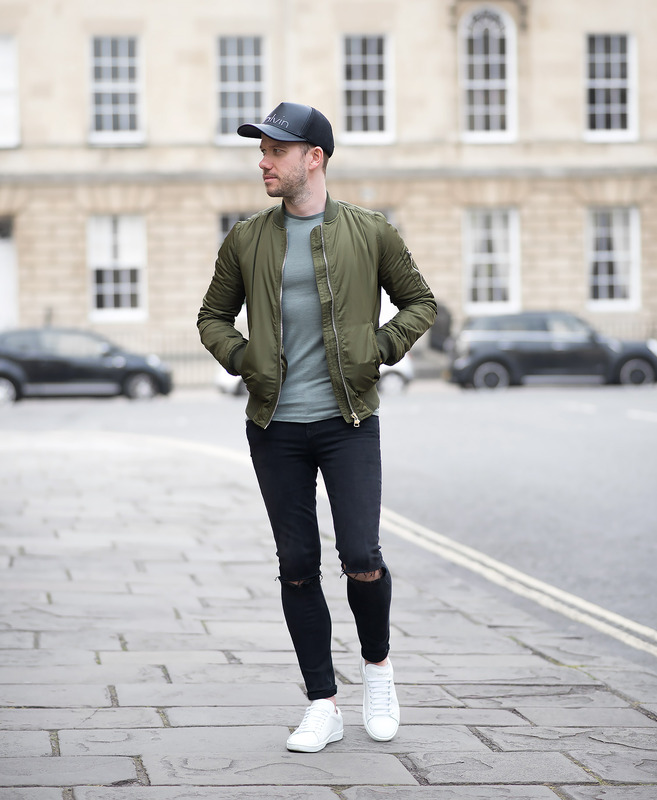 I complemented the jacket with an olive green ASOS T-Shirt which was in my wardrobe, as luck would have it, both colour tones gelled perfectly! My GRLFRND Candice Mid-Rise Super Stretch Skinny Jeans In Love Hangover were worn again! It’s testament to their quality, fit and comfort as to why they are my regular denim of choice! On my head I donned my Calvin Klein Trucker Baseball Cap, this is becoming one of my favourite accessory pieces I own (quite remarkable, considering I originally shunned away from any type of head wear, especially baseball caps!). Finally, I rounded off the outfit with my Saint Laurent Off White Court Classic Sneakers to give the ensemble that pop of contrasting brightness! 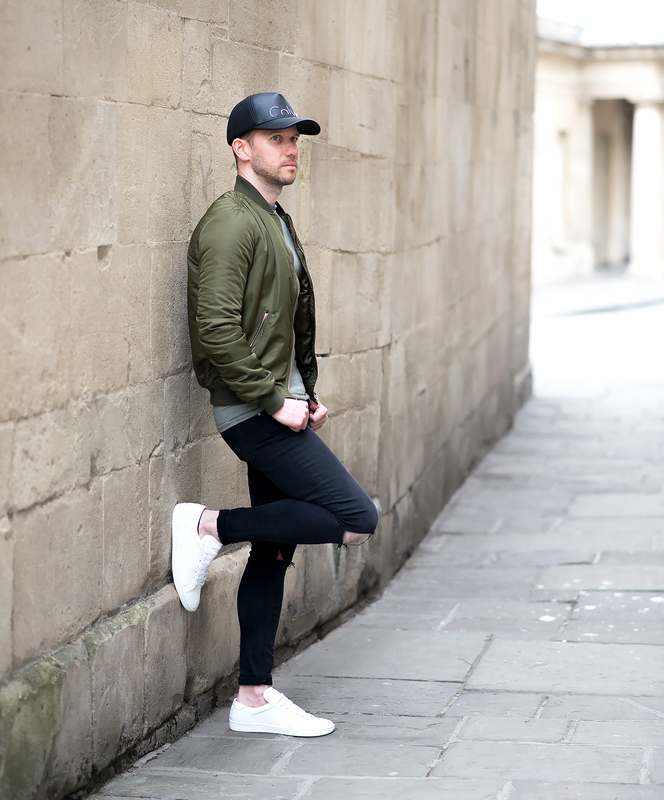 What do you think of my latest mens fashion blog outfit? Please let me know in the comments below. Hi Adam, love the blog. 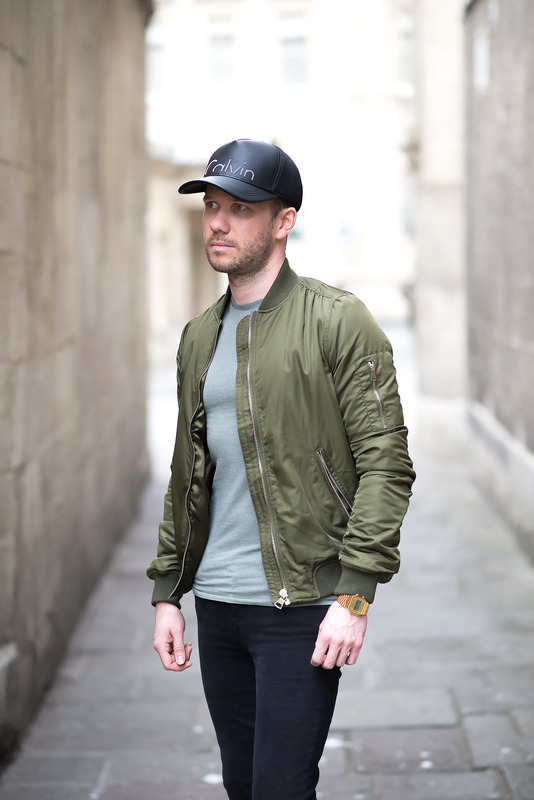 I have had the same problem with bomber jackets, would never know this is a female one. I am definitely going to give topshop a try. Not sure if you would know the answer to this but I am usually a medium in men’s jackets, any idea what I would be in a female one? I don’t think I have the guts to go into topshop and try on! Was thinking of ordering online. Hi Phil, glad you love my blog! Thank you! In regards to sizing, I generally wear an XS in most mens brands, I chose a 10 Long (so it reaches the waistband) in the Topshop jacket. From that, I would estimate you would need a 14 to get a similar fit. Maybe order a few different ones to try them out! You could also try Alpha Industries, I chose a women’s version in that too. Hi Adam, thank you for the advice. I’ll probably order the 14 and 16 to be on the safe side. The alpha one is really nice too but I have so many jackets that I probably couldn’t justify spending anymore than £50 on one. Thanks again and keep up the great work with the blog. Hi Phil, hope one of those sizes is suitable for you! Please let me know how you get on!